What kind of city do you want to live in? How should public spaces be shared? If you had the opportunity to reimagine and reshape important roadways like King and Queen Streets in downtown Toronto, would that streetscape be used differently than it is now? Today, problems of congestion, increasing urban density, and climate change have forced us to rethink the path our transportation system has taken. 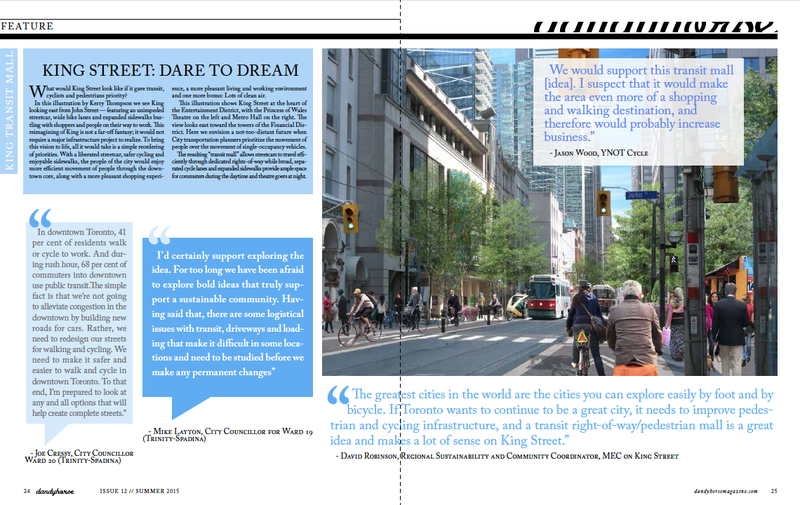 King Street could provide an excellent case study for how re-prioritizing road use could lead to a happier, healthier , more mobile and more successful downtown. One streetcar or bus full of people represents as many as 50 cars on the same road. In other words, if each of those 50 streetcar passengers decided to travel by car, the road would become even more crowded. Over much of the last century, however, most planners and decision makers have nonetheless dedicated themselves to an absurd option – prioritize the car and marginalize (or even eliminate) the transit vehicle. Today, King and Queen no longer work. Single occupant vehicles are too numerous to allow smooth traffic flow. The result: Streetcars that carry more people in less space are stuck behind the cars. So how did we get to this impass? Electric streetcars have been popular in Toronto, including on King and Queen, since the 1890s when they replaced horse-drawn transportation. Cars and bicycles made their debut around the same time. Streetcar lines were common in cities and towns across the US and Canada. In Ontario, Windsor, St. Catharines, Ottawa, Welland, Sudbury and Hamilton all had streetcar systems. Inter-urban electric rail lines provided access between cities such as Toronto and Guelph and between the cities and towns of Ontario’s Niagara Region. A dozen years later, growing grassroots resistance to the car-dominated model of transportation reached a tipping point when Premier Bill Davis stopped the proposed Spadina Expressway from cutting into downtown. The premier’s declaration about “building a transportation system to serve the people” might have heralded a new era, but you only have to stand on King or Queen today to realize that the preoccupation of transportation planners is still tilting towards the absurd “50 cars” side. Each weekday, streetcars move well over 60,000 people on King – almost three times more people than in cars. Indeed, the King 504 streetcar has been dubbed one of the busiest surface transportation routes in North America. 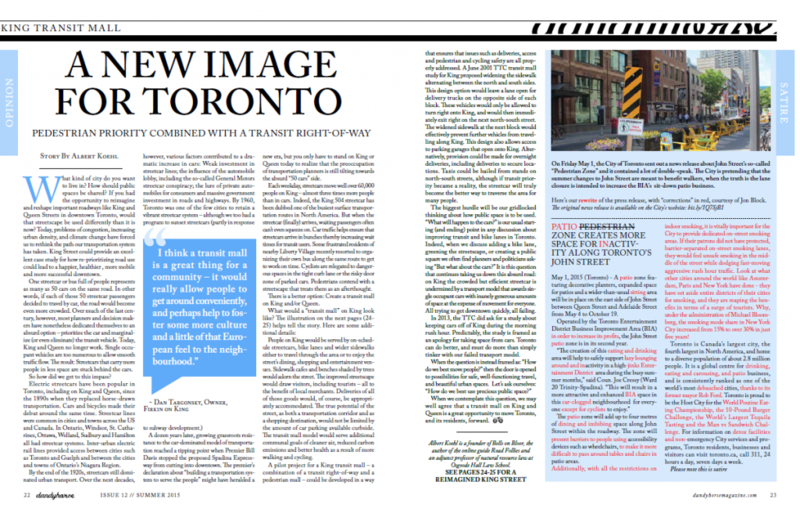 But when the streetcar (finally) arrives, waiting passengers often can’t even squeeze on. Car traffic helps ensure that streetcars arrive in bunches thereby increasing wait times for transit users. Some frustrated residents of nearby Liberty Village recently resorted to organizing their own bus along the same route to get to work on time. Cyclists are relegated to dangerous spaces in the tight curb lane or the risky door zone of parked cars. Pedestrians contend with a streetscape that treats them as an afterthought. There is a better option: Create a transit mall on King and/or Queen. 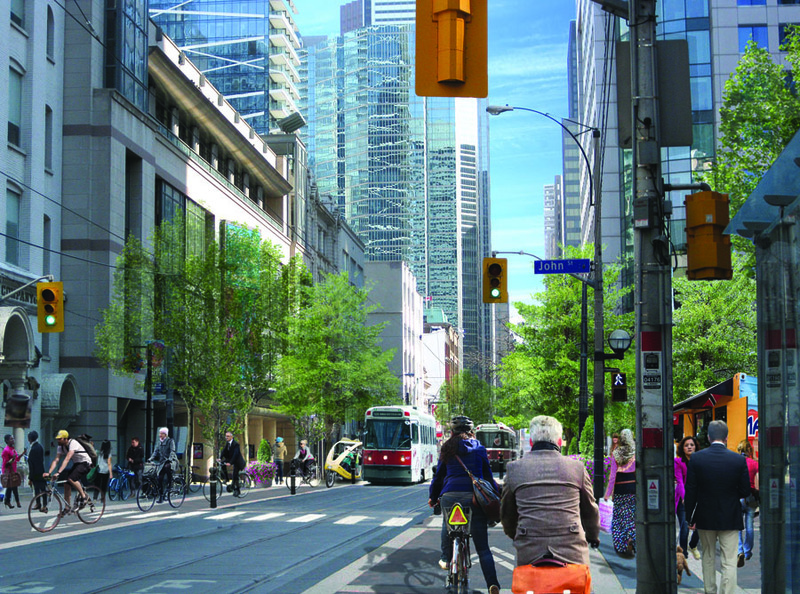 People on King would be served by on-schedule streetcars, bike lanes and wider sidewalks either to travel through the area or to enjoy the street’s dining, shopping and entertainment venues. Sidewalk cafes and benches shaded by trees would adorn the street. The improved streetscape would draw visitors, including tourists – all to the benefit of local merchants. Deliveries of all of those goods would, of course, be appropriately accommodated. The true potential of the street, as both a transportation corridor and as a shopping destination, would not be limited by the amount of car parking available curbside. The transit mall model would serve additional communal goals of cleaner air, reduced carbon emissions and better health as a result of more walking and cycling. A pilot project for a King transit mall – a combination of a transit right-of-way and a pedestrian mall – could be developed in a way that ensures that issues such as deliveries, access and pedestrian and cycling safety are all properly addressed. A June 2001 TTC transit mall study for King proposed widening the sidewalk alternating between the north and south sides. This design option would leave a lane open for delivery trucks on the opposite side of each block. These vehicles would only be allowed to turn right onto King, and would then immediately exit right on the next north-south street. The widened sidewalk at the next block would effectively prevent further vehicles from travelling along King. This design also allows access to parking garages that open onto King. Alternatively, provision could be made for overnight deliveries, including deliveries to secure locations. Taxis could be hailed from stands on north-south streets, although if transit priority became a reality, the streetcar will truly become the better way to traverse the area for many people. The biggest hurdle will be our gridlocked thinking about how public space is to be used. “What will happen to the cars?” is our usual starting (and ending) point in any discussion about improving transit and bike lanes in Toronto. Indeed, when we discuss adding a bike lane, greening the streetscape, or creating a public square we often find planners and politicians asking “But what about the cars?” It is this question that continues taking us down this absurd road: on King the crowded but efficient streetcar is undermined by a transport model that awards single occupant cars with inanely generous amounts of space at the expense of movement for everyone. All trying to get downtown quickly, all failing. In 2013, the TTC did ask for a study about keeping cars off of King during the morning rush hour. Predictably, the study is framed as an apology for taking space from cars. Toronto can do better, and must do more than simply tinker with our failed transport model. When we contemplate this question, we may well agree that a transit mall on King and Queen is a great opportunity to move Toronto, and its residents, forward. Albert Koehl is a founder of Bells on Bloor, the author of the online guide Road Follies and an adjunct professor of natural resource law at Osgoode Hall Law School.